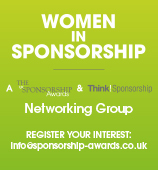 The UK Sponsorship Awards has partnered with GlobalSportsJobs, the leading specialist digital talent platform for the international sports industry, to showcase the latest relevant commercially focused vacancies. Below is just a small selection of vacancies currently advertised on GlobalSportsJobs.com. Click here to view all vacancies, setup automated email alerts or upload your CV. Alternatively, if you are looking to advertise a vacancy on the state-of-the-art GlobalSportsJobs.com platform or learn more about how the platform is unique in the sports industry, click here to visit their recruiter portal.